CHICAGO--(BUSINESS WIRE)-- Hyatt Hotels Corporation (NYSE: H) today announced the expansion of the Hyatt Centric brand with the first international Hyatt Centric hotel slated to open in mid-2016 in Montevideo, Uruguay, and the development of the first Hyatt Centric hotel in Tokyo, Japan. In addition, three Hyatt hotels in the U.S. – California, Utah and Texas – are moving under the Hyatt Centric brand. In mid-2016, the Hyatt Centric brand is expected to expand globally with the opening of its first international hotel, Hyatt Centric Montevideo, Uruguay. The 178-guestroom hotel will be located in the famed Pocitos neighborhood and will sit waterfront on River Plate along the Rambla Republica del Peru. With its prime location, guests will be able to explore and experience the city like a local along the Rambla, where Montevideans meet on weekends for exercising, socializing and taking advantage of the best sunset views in the city. The hotel will be in close proximity to the business district and tourist sites, including Ciudad Vieja, the World Trade Center and the Montevideo Shopping Center. Guests will also have access to over 1,100 square feet of flexible meeting space, a signature local restaurant and a rooftop executive lounge. This hotel was previously announced as Hyatt Montevideo. Expected to open in early 2018, Hyatt Centric Ginza Tokyo will be the first new-build Hyatt Centric hotel in Asia Pacific. 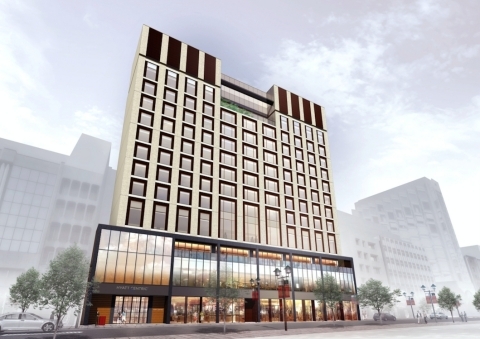 The 164-guestroom hotel will be located in Ginza, the prominent luxury fashion and entertainment center of the city on Namiki-Dori, and will occupy the top 10 floors of the 12-story commercial building tentatively known as the Ginza Asahi Building owned and under development by Asahi Shimbun. The hotel will offer dining and a bar with terrace seating, meeting space suited for gatherings, and a fitness center. The flexible design of the dining area can be arranged to host a variety of events from meetings to receptions. The interior design will reflect Ginza’s special blend of tradition and innovation. The three new Hyatt Centric hotels in the U.S. were chosen based on their sought-after locations and due to their unique designs that reflect the hotels’ surroundings and local flair. The new additions join the two hotels that opened in 2015, Hyatt Centric The Loop Chicago and Hyatt Centric South Beach Miami, and demonstrate the brand’s strong growth plans. The vision for Hyatt Centric hotels is to collaborate with regional food and beverage partners to provide guests and locals with cuisine crafted by in-demand chefs. Additionally, the brand will introduce high-quality amenities such as salon-quality hair dryers, soft hooded bathrobes, and renowned bath products. Hyatt Centric hotels are full-service lifestyle hotels created for millennial-minded guests who view their hotel as more than a place to stay. Each hotel has its own personality and offers guests a story to tell, through its eclectic and fun touches and signature Hyatt Centric elements, including spaces like The Corner, where guests can work, socialize and peruse a curated collection of local books and magazines, and a bar and restaurant area that help foster great conversations and deliver thoughtful, locally inspired food and signature cocktails. Hyatt Centric hotels are centrally located so that both leisure and business travelers can easily explore the destination and get a feel for the local flavor. The Hyatt Centric brand is designed with the concept that “sometimes less is really more.” All the must-haves that guests expect from a full-service hotel are there but in the most intuitive and simple way (e.g., express dispatch service allowing guests to enjoy gourmet food in their room). While guests can enjoy the in-room technologies designed to connect seamlessly with their devices and media, a staff of knowledgeable associates is on hand to aid guests in their discovery of their surroundings. For more information on Hyatt Centric hotels, visit www.hyattcentric.com.